Vegetables can be a challenge to eat for some folks... like my husband. 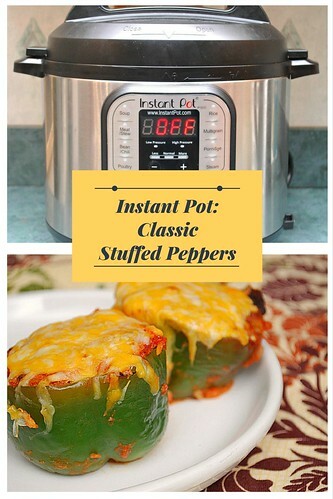 So in an effort to encourage more vegetables in our diet, I made these Classic Stuffed Peppers overflowing with deliciousness. Oh, there was no question these were delicious, as my husband ate it all! Cut off the tops of the green peppers and remove the inner membranes; set aside. Press SAUTE and add 1 tablespoon oil. Add ground beef and brown. Season with salt and pepper to your tastes.Transfer beef to a large bowl. In a large bowl to the ground beef, add the rice, garlic, drained tomatoes, 1 cup shredded cheese, parsley, salt and black pepper; mix to combine. Fill each pepper with the rice and beef mixture. Transfer stuffed peppers into a 6inch springform pan. In the now empty IP, add 1 cup of water and place trivet over the water inside the the IP. Place springform pan filled with peppers on top of trivet. Stir together ketchup and reserved 1/4 cup tomato juice in small bowl. Spoon 2 tablespoons ketchup mixture over each filled pepper. When the IP beeps after pressure cooking for 15 minutes, allow your IP to naturally release pressure - about 12-15 minutes. While naturally releasing pressure (also known as NPR or NR), the display will reflect numbers counting up from 1. The numbers indicate how many minutes the IP has stopped cooking since it beeped (or how many minutes it has been naturally releasing pressure). No need to touch your IP while it naturally releases pressure. The pin at the top of your IP will drop when all pressure has been released and it's safe to open. Check the internal temperature of each pepper using an instant read thermometer. The temp should be at least 160 degrees for ground beef. 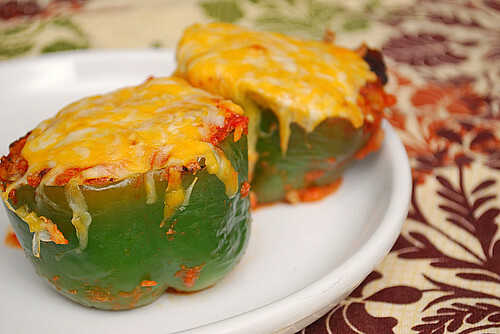 Sprinkle the remaining 1/4 cup cheese evenly over each pepper and secure the lid of the IP. Allow the cheese to melt for 2-4 minutes. Remove the lid and serve immediately.